Accessories integrated in workplaces allow handsfree work with animals and cages. Galilei POC carts are mobile, modular and adaptable to daily work in the animal room. The carts are manufactured according the requirements of the daily work. The integrated tables are adjustable in height. The PC mounting is adjustable in height and in azimuth angle as well as in topview angle. Integrated tablet PCs or all-in-one PCs. 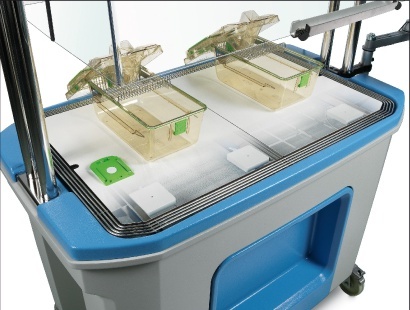 By embedding one or several readers into the changing station, point-of-cage communication can also be installed in existing laminar flow stations of various providers. Would you like to have your hands free for your animals and cages ?